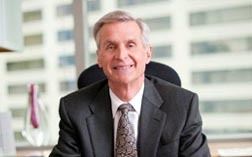 Chris Tompkins is a trial attorney with over 35 years experience, his practice concentrates on the defense of product, professional, environmental, and general liability claims as well as insurance coverage and extra-contractual liability. Obtained a defense verdict in a legal malpractice case on behalf of a dissolution attorney. Plaintiff alleged that he incurred approximately $1.3 million in damages due to his former attorney’s negligence in drafting and advising him to sign a property settlement agreement. After an eight day trial, the jury returned its defense verdict after deliberating for approximately four hours. Representation of the manufacturer of a fire engine which did not pump upon arrival at a fire. Pre-litigation investigation and inspections have been undertaken, and claims on behalf of five individuals killed in the fire are anticipated. Defended a manufacturer of medical imaging devices. Plaintiff brought an action for injuries she sustained when an x-ray table lowered on her foot. The court granted our motion to dismiss, holding that the plaintiff failed to exercise due diligence in discovering facts that were salient to her claims and that her claims were time-barred. Defense of agricultural chemical manufacturers against claims for both physical injury and for crop damage allegedly resulting from the use and application of pesticides. Claims defended include groundwater contamination claims asserted in Washington, California and Hawaii by residents near application sites; claims by cities and water districts for contamination of drinking water aquifers; and clean up claims brought by the State of Washington under novel theories of liability. The Washington neighbors’ claims were tried to a defense verdict; claims by 350 Honolulu residents were dismissed on summary judgment; and the remaining claims were favorably settled. Defense of manufacturers of pharmaceuticals and medical devices, including mechanical heart valves, prosthetic joints and implants, spinal stabilizers, penile prostheses, latex gloves, Rezulin®, hormone replacement therapy and phentermine in courts throughout the Northwest. Defense of class action lawsuits brought against a private drinking water company based on copper levels in violation of State and Federal drinking water requirements. One action was tried to a favorable verdict; remaining claims were subsequently settled. Defended nationally and internationally recognized manufacturers of products used in the home and in commercial industry against claims alleging exposure to benzene. Through extensive motion practice, we obtained case management orders which required plaintiffs to specifically plead with particularity the product to which they were exposed, the dates when such exposure occurred, and where such exposure allegedly occurred. Plaintiffs’ claims against our clients were subsequently dismissed through agreement or on summary judgment because plaintiffs were unable to comply with this requirement. Defended a company sued for over $1 million because its product allegedly failed, causing damage to the product manufactured by plaintiff to which it had been applied. Discovery and motion practice resulted in a settlement with plaintiff paying our client substantial amounts previously withheld. Defense of the manufacturer of a medical device for aphoresis of cholesterol against patent infringement claims. Representation of a tobacco manufacturer against product liability and cost recovery claims brought by Regence (Blue Cross/Blue Shield) Companies and Washington Association of Public Hospitals seeking recovery of health care expenses related to use of tobacco products. Defense of failure to warn claims against a distiller sued in one of the first claims against alcoholic beverage companies alleging fetal alcohol syndrome as a result of a pregnant woman’s consumption of alcohol. Plaintiff dismissed the case after a jury found against a different plaintiff in a similar case. Defense of breach of contract and negligence claims brought by a railroad against a re-railing contractor seeking to recover for a derailment which occurred during cleanup of a prior derailment and of design defect and failure to warn claims against the manufacturer of a manually retractable hitch for loading containers or trailers onto railroad cars. Defense of a motor vehicle manufacturer against design defect claims alleging serious injury, paraplegia, or death arising out of alleged defects in motor vehicles. Defense of a quadriplegic passenger’s claims arising out of a collision between an automobile and an agribusiness company’s combiner convoy on an interstate highway. Defense of personal injury claims alleging improper maintenance by the lessor of a rotary hammer. A jury returned a verdict for the lessor. Defense of breach of contract claims against a company which terminated its broker for long-term disability benefits offered to the company’s independent agents. Trial resulted in a defense judgment. Defense of insurers against extra contractual claims, including failure to settle within policy limits following multi-million dollar stipulated judgments; claims seeking coverage not bargained for upon placement; and coverage issues related to environmental, construction defect and other lines of coverage and legal issues. Defended a prominent orthodontist in a malpractice case. Parent of three patients petitioned Dental Quality Assurance Commission to sanction orthodontist for terminating care before her children’s results were "perfect." We argued orthodontist has no duty to satisfy subjective demands of patients and orthodontist acted appropriately by transferring treatment after patients' parent abused staff. The Commission found the orthodontist acted appropriately and the case was dismissed. Defended multiple attorney malpractice claims arising out of the plaintiffs’ dissatisfaction with the results of dissolution proceedings. All have been dismissed, or settled for nominal amounts, on the basis that plaintiffs could not establish that they could have negotiated, or would have been awarded, a larger share of the marital assets. Defended an attorney malpractice claim in which the underlying case was dismissed on summary judgment after our client withdrew from representation. The malpractice claim was dismissed on summary judgment as plaintiff could not establish a triable issue of fact as to whether we would have prevailed in the action below in the absence of the alleged negligence. Defended a dental clinic against a Consumer Protection Act claim alleging that a prosthedontist utilized “cow bone” instead of human graft substrate during a bone graft prior to placing implants. The case was dismissed on summary judgment by the trial court. The Court of Appeals reversed, but the Supreme Court granted discretionary review and reinstated the dismissal, holding that the public interest element of the CPA had not been met. Publication, And The Defense Wins, The Voice, DRI Weekly Newsletter, (May 8, 2013). Presenter, Defending Against Efforts to Expand the Scope of the Act: Mosquera-Lacy and its Aftermath, A Trial Lawyer's Guide to the Washington Consumer Protection Act: The Act from Every Angle, Washington State Bar Seminar, (August 2010). Mr. Tompkins has spoken and published on environmental, product liability and professional liability issues in a number of contexts, including the Product Liability Advisory Council, the International Association of Defense Counsel and the Defense Research Institute. Mr. Tompkins was named the number one practitioner in the state of Washington for product liability expertise, according to the Fifth Edition of The International Who's Who of Product Liability Defense Lawyers.